The price of bitcoin on Coinbase is tradng down -$129 at $3412.04. The low today reached $3374.01. The high extended to $3544.59. The move lower took the price below the low from last week (and the year) at $3425. The pair is trading at the lowest level since December 17. Helping the technical bias is that the high over the weekend, stalled right at the 50 day MA (white line at $3660.92). THe price has closed below that MA on all but one day since January 10th. The low today did test a lower trend line at $3391. The price did move below, but has recovered back above the level. A move below would be more bearish. 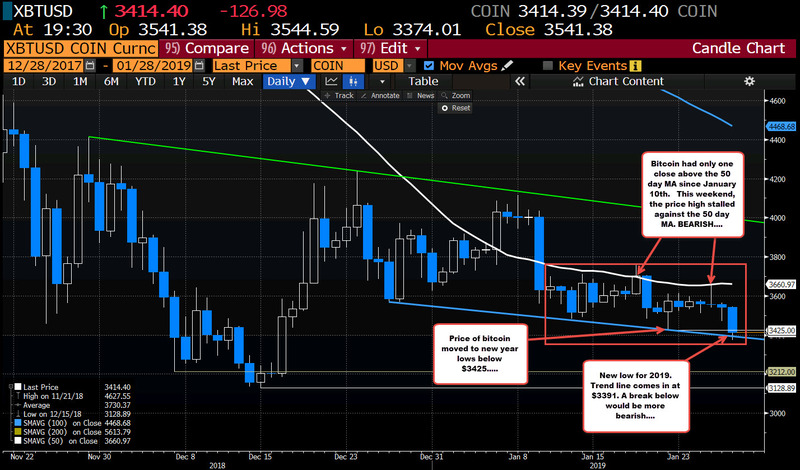 On a break, the next targets come in at $3212 and the 2019 low price at $3128.89.